Many people are affected by Breast Cancer. My Mother is a survivor as well as her sister and several of my friends. The patterns here are dedicated to them. 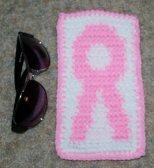 Make these patterns for your friend or family member who has battled this disease.